Chapeau to both Matthew and Tom , Matthew has ran one of the fastest USA 5000m times, Tom has ran a 2h 25 min marathon , the power of running as a training tool. Iowa runners go big in… cycling? Former Division 3 runners from Iowa colleges continue to make their name in the professional cycling ranks. Tom Zirbel, a 2001 Wartburg grad finished 2nd in the USA Cycling Championships individual time trial while 2007 Luther graduate Matthew Busche finished 3rd. On Monday Busche surprised everyone by winning the road race in a photo finish over one of the country’s all time great cyclists, George Hincapie. Busche, who rides for Team Radioshack, will now be wearing the Stars and Stripes jersey in European races for the next year. While it’s doubtful that Busche will be riding in the Tour de France this year, I would expect to see him there in the next few years. I remember several years back when I was still living in Madison, WI. At a cycling race I remember hearing a few people talking about how “some college runner from Iowa” showed up at a race the day before and utterly dominated everyone. Thanks to Google it didn’t take me long to figure out who that was (Busche) but that fall he was back running again, and was an All American in cross country. At the time cycling was just a means of staying in shape for running. It’s not that way any more. Congrats to both ex-Iowa Conference runners! 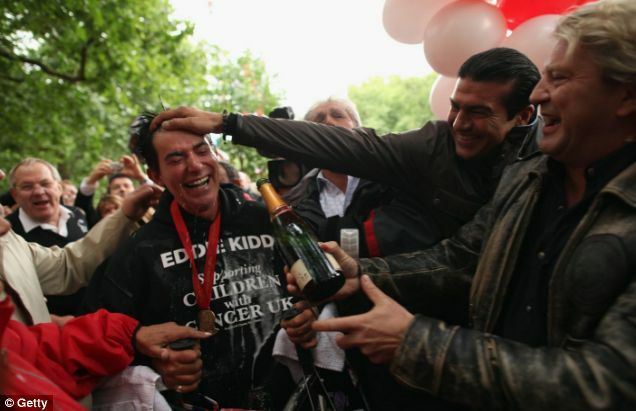 Eddie Kidd, former stuntman, crossed the London marathon finish line on Monday after 43 days – and was promptly hailed ‘a legend’ by Twitter users. The 51-year-old, paralysed and brain-damaged after a motorbike crash in 1996, completed the 42km (26 mile) route and raised £75,000 for charities Children with Leukaemia and The Eddie Kidd Foundation. ‘I’m lost for words,’ said his wife, Sam, 42. ‘It’s the best thing he has ever done. I’m so proud of him. 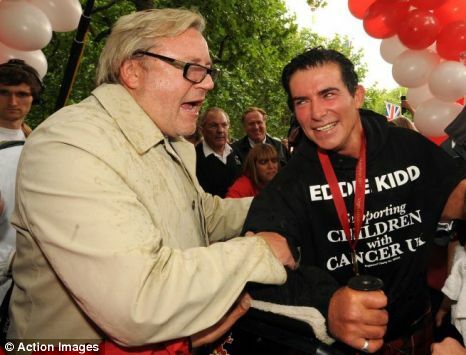 As a beaming Eddie walked the last steps of the marathon on a special frame, helped by Sam, actor Ray Winstone and former The Bill star Graham Cole, crowds of supporters erupted in jubilation. His wife, a former model, cried with joy as her husband popped champagne was was sprayed with the drink by family and friends. ‘Hair ops, infidelities, super-injunctions, talent show judges, actors, MPs, comedians etc. Role model for your kids? Eddie Kidd,’ tweeted justinmoorhouse. 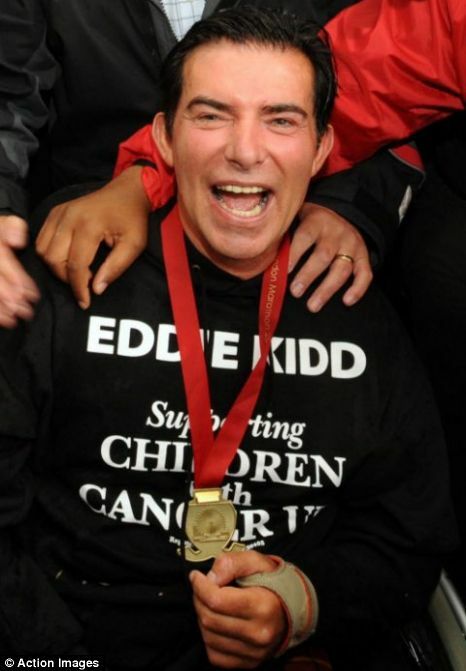 ‘This story about Eddie Kidd completing the London Marathon really moved me – what guts and what an inspiration,’ said fellow Twitter user brilliantfish. One of Eddie’s most famous moments came in 1993 when he jumped the Great Wall of China and beat Robbie Knievel – Evel Knievel’s son – to the stunt bike world championship.